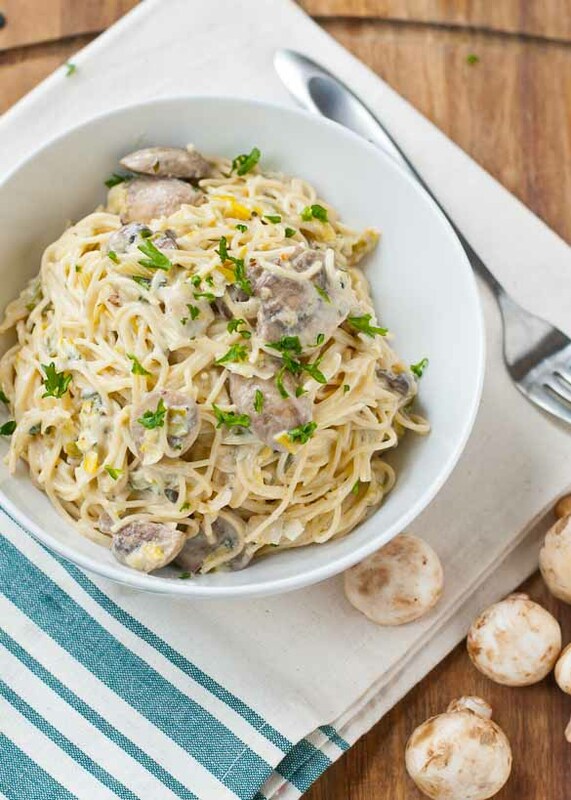 Creamy Parmesan Leek and Mushroom Pasta is a satisfying meatless meal that comes together in under 30 minutes. Today there was golden sunlight and muddy dog paws and a needle on the thermometer that might have edged past 50. I can see the grass again and the sky is blue and cloudless. The air feels like change, and I couldn’t be more ready. I don’t know about all of you, but around here this has felt like the long, long, cold, long, snowy, long, freezing, long, gray (did I mention L-O-N-G??) winter. But these sunny days are reminding me that winter will eventually have to give way to spring. It may not happen overnight. It may be slower than I’d like. But one day I’ll be walking through the grass in bare feet, gazing at a flower budding up from the earth, and I’ll realize, we made it. Spring is here. And there will be much rejoicing. 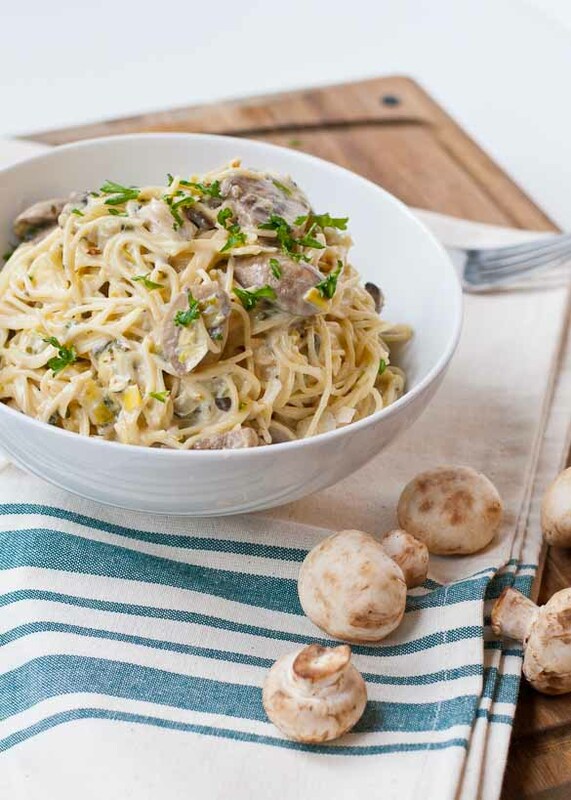 Until that day comes, I’m surviving on recipes like this Creamy Parmesan Leek and Mushroom Pasta. I like to think of them as “bridge” recipes. They’re still comforting and hearty enough to warm your bones on a cold night, but they have a bit of spring’s lightness as well. Meat feels so necessary in the winter when the wind is blowing and seasonal produce is limited. But as the days get longer and warmer and the produce gets brighter and juicier, I love going meatless, which is exactly what our #SundaySupper team is doing today. This pasta recipe gets it’s peek of spring from leeks. I’m new to the leek scene, but after trying them in this recipe I know they’re going to be making many more appearances this spring. They have a nice mellow onion flavor that is noticeable, but not overpowering. If you need some guidance for prepping and cleaning the leeks, Natasha’s Kitchen has some great step by step photos. The heartiness of this pasta comes from a rich Parmesan cream sauce. I can’t resist a simple cream sauce. It’s so luxurious, so velvety, so incredibly satisfying. I’m normally not a huge fan of angel hair pasta, but this sauce is absolutely made for it. 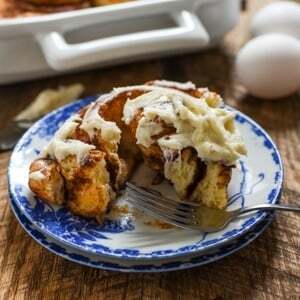 It coats the strands so perfectly, you’ll have a hard time not slurping them up. I made this pasta one night after a long day of work. It was one of those I’d-rather-order-takeout nights, but I pushed through and made this recipe. Luckily, it was a breeze to make and we had this made, devoured, and dishes done by 7 PM. You have to understand, this never happens. I was amazed to look at the clock and realize we had several hours of the night left to watch old episodes of Seinfeld work on the bedroom remodel. There you have it…a 30 minutes, no hassle, satisfying meatless meal to get you through these last winter days. The #SundaySupper team has a lot more meatless meal ideas for you below the recipe. Be sure to check them out! Creamy pasta’s are my favourite! I often cook pasta as it is so quick to make! I am really trying to like mushrooms! I have been testing them out in restaurants and found that they aren’t to bad! I think I would just love it in your pasta dish!! It’s perfect!! I hope you’ll start to love mushrooms. They’re one of my favorite foods! Leeks and mushrooms are meant to go together! This looks yummy! Yes they are! Like PB&J! Think looks and sounds absolutely delicious! I almost licked the screen!! I could eat this anytime of year! oh my gawd Courtney!!! This pasta dish looks sooooo good! it’s dishes like these that make me think I could go vegetarian. . I love leeks. . you have to try leek and potato soup. . I use leeks all the time now . . and on pizza too. Totally making this ASAP. What a perfect meatless weeknight dinner. I’m always looking for delicious, easy, quick meatless dinner after a long day! This sounds like the perfect, comforting pasta dish! Leeks are one of my favorite things, Courtney. I’ve been know to roast them and eat the whole pan myself. 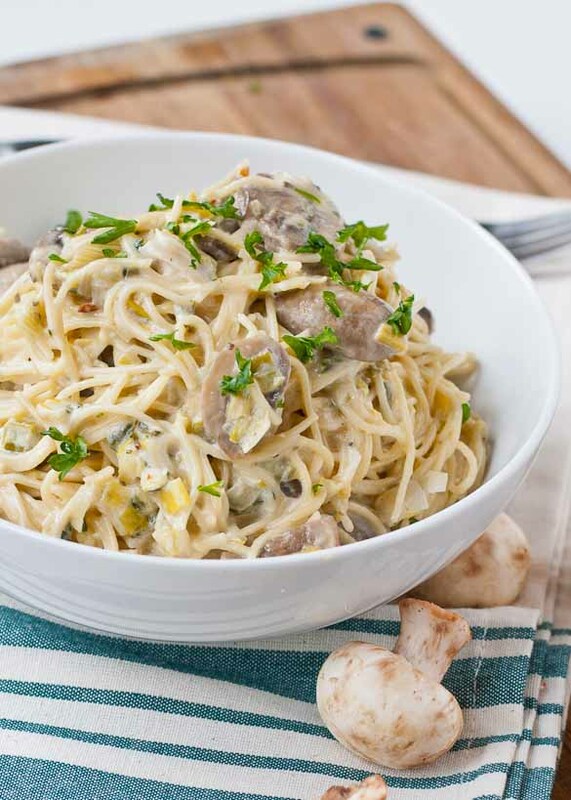 🙂 I love your creamy pasta with Parmesan, leeks and mushrooms! Delicious! I could slurp a great big bowl. I think I’ll do the same. The smell of them sauteeing was so dreamy. I will be giddy when spring finally gets here!! and until then, I’ll be giddy about this creamy pasta. YUM. I am oh so very ready for spring and I’d be ready to eat a big bowl of this pasta anytime. Muddy dog paws…and belly…and chest…and tail….and booty. We’ve gone through SO many dog-wiping towels in the last few days. I could totally devour a huge bowl of this pasta. It has almost all of my favorite ingredients. Love the leeks! Ugh us too! I feel like I’ll never stop doing laundry! Perfect spring meal! I haven’t had angel hair pasta in so long and now I’m craving it! Plus leeks, how I adore them. I don’t usually make angel hair, but I really loved it in this dish. Oh yummy! This looks so good. I’m adding it to next week’s menu. Haha! She must really love leeks and mushrooms! Oh my goodness, I already ate dinner and am stuffed at yet I think I could still eat a bowl of this. I am pinning for later. You’ve combined all my favorite flavors into this dish and I’m craving this so bad 🙂 Such a great idea for a meatless meal! 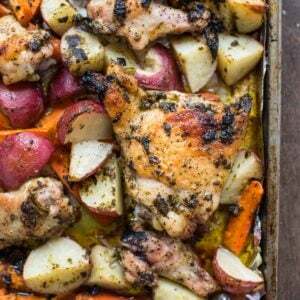 Gosh this looks so good, I miss cooking with leeks I have to try this! Now I know what I’m making for dinner tomorrow! This looks so amazing YUM! 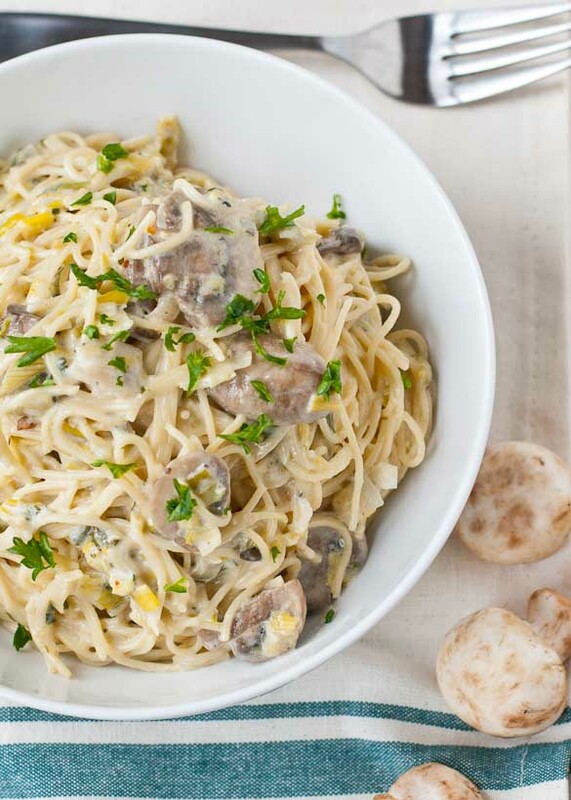 Courtney – this pasta looks fantastic! I, too, have been looking for ‘bridge’ recipes (i love that term) and this pasta is perfect. Thanks so much for sharing! also, your photos are gorgeous!! Thanks so much Emily! That means a lot, especially since I’m always so inspired by your photos! Kristen made this last night. It was sooooooo delicious!! I can’t wait for the leftovers. That’s hilarious because I was just thinking we need to make this again. Must be the weather has me craving pasta! I’m so glad you guys liked it!